Streaming video and digital textbooks in the classroom. Stronger assessments through technology. Build your own curriculum and the globalization of education standards. These issues are no longer speculation but reality. These are the people that are making it happen. Ready or not, here they come. Sure, you still probably still use YouTube for crazy pet and cute baby videos, but with 800 million unique users a month, there is no denying that the video site has changed the world. 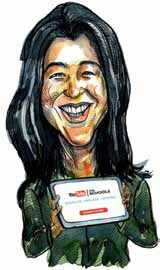 Now Angela Lin, overseer of the recently launched YouTube Education project, is hoping to do the same for the classroom, just without the pets and babies (or worse). “This marks a major advance in the unfolding YouTube.edu story,” Lin says. “By cordoning off YouTube searches instead of just blocking them, elementary and secondary teachers can start using YouTube to support their lessons.” A new coding system will enable school network administrators to have more control over which YouTube videos are available to students on public or shared computers in their libraries and classrooms. Teachers can also search by topics and even “grade-level” TED talks like “Doodling in Math Class: Infinity Elephants” and MIT’s “Introduction to Computer Science.” Like it or not, videos are quickly becoming part of the everyday curriculum. Having issues about assessment? Send them to Dr. Eva Baker. She co-chaired the committee that produced Standards for Educational and Psychological Testing published in 1999. She currently directs UCLA’s Center for the Study of Evaluation (CSE), the Center for Research on Evaluation, Standards, and Student Testing (CRESST), and an ancillary CRESST-sponsored project called the Center for Advanced Technology in Schools (CATS). Baker focuses her research on incorporating instruction and measurement, evaluating design and practical validation of principles for developing instructional systems, and learning new measures for studying complex human performance. Baker believes that testing as we know it will have varying shelf lives depending upon purposes. “In the shorter run, they will be incorporated in learning proficiency systems where completions undefined will be accumulated and tagged,” she explains. “These proficiencies or qualifications can then be referenced to content, skills, problem solving, and other innovations that will matter in unpredictable new jobs, social and self-management skills, and affective and personal development.” In other words: The bubble test is dead! Martin Dougiamas’ Moodle software may be the most recognized yet least understood in edtech. He began working on the Internet when he was 10 years old – in 1986 – which truly earns him the lifelong moniker of “Internet guy.” He is also the reason open source continues to grow in education circles. When he launched his first version in 2002, he says, “I was frustrated with the existing commercial software at the time.” Since then, the project has been growing exponentially in terms of size and activity. “I work from home each day with many different people from around the world on an ever-widening variety of things. It’s challenging but exciting and certainly gives me good reason to jump out of bed in the mornings.” As of December of 2011, Dougiamas’ course management system had a user base of 72,177 registered and verified sites, serving 57,112,669 users in 5.8 million courses. Be ready—it should be coming to a classroom near you. We know what you’re thinking: Where are the teachers? In each of the past three years we have received complaints about the lack of actual educators on our list. Point taken. But even though we love our teachers and tech coaches (after all, we highlight them every month in print and every day online), the most influential of them all isn’t going to sway the nation’s curriculum adoption to digital like Marjorie Scardino can. Andrea Keller has taught special education for nine years and the last four of those years have been in a pervasive developmental disorder K-3 unit. Although Keller's students are often low-verbal or non-verbal, she adapts and modifies so they can participate in podcasting, vodcasting, and video conferencing. Her grant for 50 webcams allows all of the self-contained LIFE/PDD units in the district to video conference with other special needs students and classrooms around the globe. See more on her blog, Busy Bee blog, http://busybeeideas.blogspot.com. Rather than seeing Facebook as a distraction, Geometry teacher Felicia Owen is now using it for interaction both inside and outside the classroom. By allowing students to submit assignments using their cell phones, some previously underperforming students became very responsive. Owen's innovative use of social media in the classroom has inspired other teachers and attracted local press coverage.